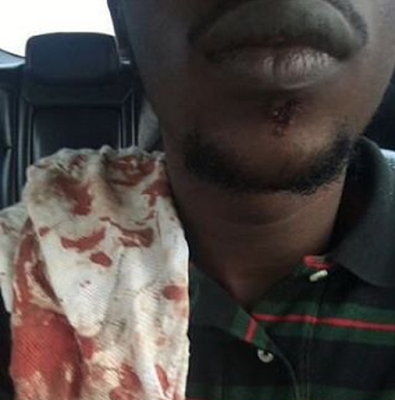 According to sources at the club, in the early hours of today Jan. 15th, Dammy Krane, who called Wizkid out on social media a few days ago for stealing his slangs and lyrics, was attacked by the singer at Obafemi Martin's All Black party at Quilox night club. The two were said to be sitting on the same table with Obafemi Martin and others when the fight broke out. They said Wizkid didn't like a comment Dammy Krane made at the table and without warning, punched Dammy in the face, some claim he hit Dammy with a glass cup. Dammy picked up a bottle and threw it at Wizkid but missed and before he could do anything else, others got involved and separated the two. Club owner Shina Peller then took them to his office to settle issues. The two music artists are yet to say anything about the incident on their respective social media pages.